The perfect mixer for the serious home baker, the start-up, or even established business. 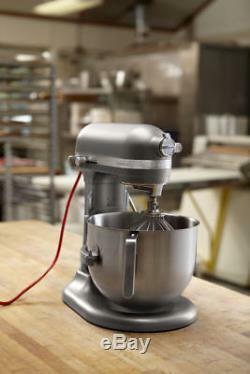 The Kitchenaid Commercial 8 Qt Mixer has all the capacity and power you will need. The commercial mixers with a DC motor delivers. 44 HP to the mixers bowl for consistent power to mix small and large batches with less heat build-up. 10 speeds allows you to go from a slow stir to a fast whip with ease. NSF and UL certified this Kitchenaid commercial mixer is approved for us in the commercial environment. Like most Kitchenaid Mixer this 8qt Commercial Stand Mixer has the standard KitchenAid attachment hub allowing you to use your stand mixer for much more then just mixing. 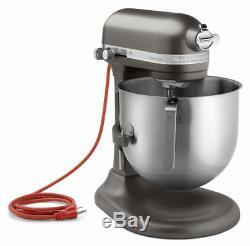 This commercial mixer does include a stainless steel wire whip, flat beater, and dough hook. 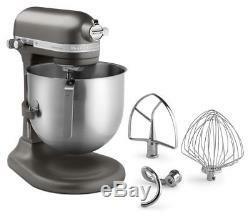 KitchenAid Dark Pewter Commercial Stand Mixer. 48 inch long power cord. 1.3 HP DC motor. 44 HP to the bowl. Assembled with Pride in Greenville, Ohio. Mixer Dimensions: 14.6" L x 13.3"W x 16.5H. The item "KitchenAid 8 Quart Commercial Stand Mixer (NSF Certified) Dark Pewter" is in sale since Wednesday, October 24, 2018. This item is in the category "Home & Garden\Kitchen, Dining & Bar\Small Kitchen Appliances\Countertop Mixers". The seller is "frisco_trading_company" and is located in Springfield, Missouri. This item can be shipped to United States, Canada, United Kingdom, China, Mexico, Germany, Japan, Brazil, France, Australia, Denmark, Romania, Slovakia, Bulgaria, Czech republic, Finland, Hungary, Latvia, Lithuania, Malta, Estonia, Greece, Portugal, Cyprus, Slovenia, Sweden, South Korea, Indonesia, Taiwan, South africa, Thailand, Belgium, Hong Kong, Ireland, Netherlands, Poland, Spain, Italy, Austria, Bahamas, Israel, New Zealand, Singapore, Switzerland, Norway, Saudi arabia, Ukraine, United arab emirates, Qatar, Kuwait, Bahrain, Croatia, Malaysia, Chile, Colombia, Costa rica, Panama, Trinidad and tobago, Guatemala, Honduras, Jamaica, Viet nam.